Baby bonds, a proposal embraced by likely presidential candidate Cory Booker, would give newborns savings accounts that would be worth tens of thousands of dollars by age 18. It’s an ambitious plan — and, according to a new study, it would almost entirely close the wealth gap between black and white young people. 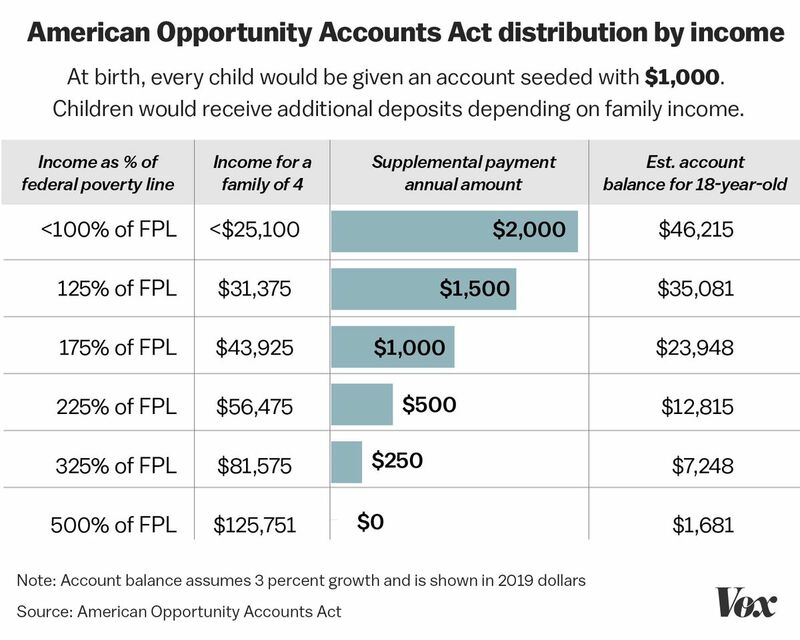 Booker’s plan would offer all newborns $1,000, and then add up to $2,000 annually for children in low-income households. By age 18, that could add up to serious money; Booker’s team estimates that for kids from lowest-income families, the nest egg would average some $46,000. The new analysis by Columbia postdoctoral researcher Naomi Zewde looks at what kind of effect such a nest egg would have on our racial wealth gap. It’s a pretty stark divide: Zewde estimates that in 2015, the median white person aged 18 to 25 had a net worth of $46,000. The median black person, by contrast, had a median net worth of $2,900. That’s a ratio of 15.9: White young people were nearly 16 times richer than their black counterparts. Zewde looked back and estimated what those 18- to 25-year-olds would have as net worth had a baby bonds policy been law at their birth. In part because her research began before Booker unveiled his specific proposal, the proposal she models is not identical to Booker’s, but both arrive at similar bond values for children depending on their economic background. Because the bond values are similar, the results are a good approximation of what Booker’s bill would do. The baby bonds’ effect is striking. In a baby bonds scenario, the median white young person would have had a net worth of $79,159. The median black young person would have had a net worth of $57,845. A gap remains, but the ratio has been reduced to 1.4. In other words, Booker’s proposal comes close to eliminating the racial wealth gap entirely for young adults. To understand why baby bonds — a proposal that is facially race-neutral — has this dramatic an effect on the racial wealth gap, you have to know a bit more about how it’s formally structured. 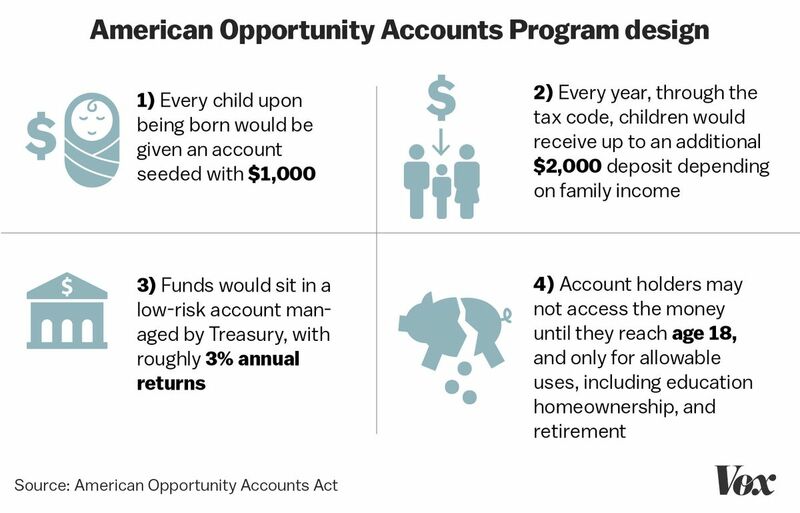 As Vox’s Sarah Kliff explained in October when Booker unveiled the proposal, every newborn would start out with $1,000 in a low-risk savings account managed by the Treasury Department. Booker’s team assumes in their analysis (as does Zewde) a 3 percent rate of return. 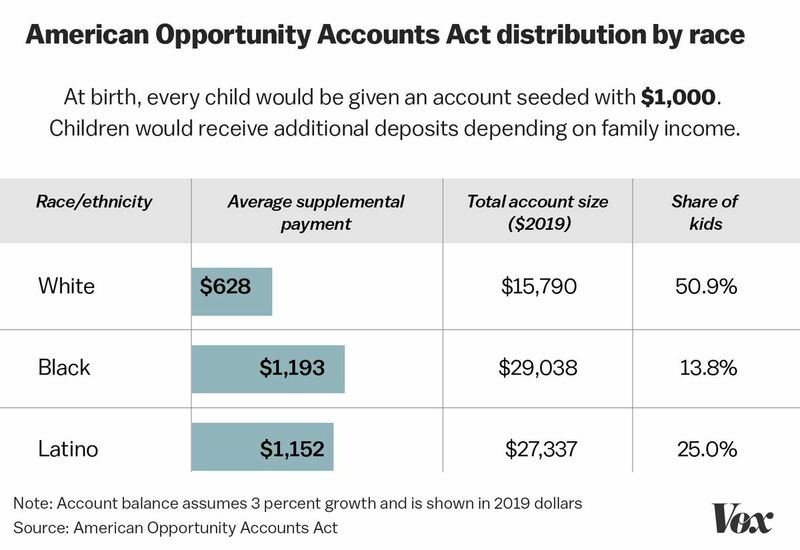 But depending on parental income, kids would get up to $2,000 added to their account every year. A kid in a family of four earning over $126,000 would get nothing, but everyone under that would get an annual contribution of up to $2,000 (with the highest amount reserved for families below the poverty line). Due to the massive income disparity between black and white Americans (and between Latinx and white Americans, too), this kind of means-testing effectively means that kids from black and Latino families get substantially more out of the program than kids from white families. Poor white young adults get exactly the same amount as poor black young adults do — but when the poor are disproportionately nonwhite, a program designed to build wealth for poor families inevitably winds up reducing the white-black wealth gap. Booker’s team anticipated this in designing the proposal. When they unveiled the bill, they provided estimates to Kliff showing that the average white child would wind up with an account worth $15,790 upon reaching 18. But the average black child would end up with $29,038, and the average Latinx child would end up with $27,337. The baby bonds idea isn’t new. British Prime Minister Tony Blair made the proposal a centerpiece of the Labour Party’s 2001 campaign, and his Chancellor Gordon Brown began implementing the plan in 2003, only to have the Conservatives cancel the accounts upon taking power in 2010. Hillary Clinton proposed a $5,000-at-birth baby bond in fall 2007 as part of her 2008 presidential bid, before abandoning the plan as the primaries dragged on. Zewde’s estimates — which use the Panel Study of Income Dynamics, a survey that has tracked a representative set of American families and their economic outcomes for over 50 years — show that for young adults, a baby bonds plan would nearly achieve a key goal of many reparations proposals: closing the racial wealth gap. That, on its own, will not eliminate economic inequalities grounded in race. While a good share of the wealth gap can be explained by white people having richer parents and bigger inheritances, the gap also tends to increase as people age — that is, the wealth gap between white and black elderly people is greater than between the young adults Booker’s plan targets. Black families experience more downward mobility when it comes to wealth over their lifespan, whereas white families are likelier to experience upward mobility. So while baby bonds nearly close the young adult wealth gap, they probably won’t do as much to close the overallwealth gap. The wealth gap also grows due to the persistent gaps in earnings and educational attainment between black and white Americans. A significant fraction of your wealth, after all, comes from portions of your income that you’ve saved in the form of home equity, pension and investment account contributions, Social Security taxes, etc. And when black incomes are systematically lower (in part because black people get access to fewer years of education), that income differential eventually accumulates into a wealth gap. Once you control for income (as poorer people can’t save as much), there’s no difference in black and white savings rates — but when income isn’t equal, that means black people wind up with less savings. The program also poses political risks, as Blair’s example shows. If Cory Booker were to take office and pass a baby bonds bill in 2021, with the first beneficiaries being babies born in 2022, the program would not start paying out until 2040. That means that at least two subsequent presidents and Congresses would need to agree not to scrap the plan — which will be especially tough because unlike, say, free college or Medicare-for-All, the plan won’t have created a constituency that benefits from it and is eager to defend it from political attack. But nearly closing the black-white wealth gap for young adults is a tremendous achievement for a policy, and could, if passed, help remedy gaps in income by giving black families resources to invest more in education, to start businesses, earn investment income, etc. That in turn could reduce the growth in the gap we currently see as people age. Given that those are savings programs that primarily help higher-income people, there would be a certain poetry in using them to finance a proposal that finally closes the black-white income gap for young people.